Compatible with 8-13 gauge wiring. Handles up to 75A current. 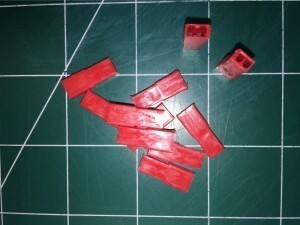 Ideal for use as ESC connectors. INCLUDES: Two 4mm Female Bullet Connectors. 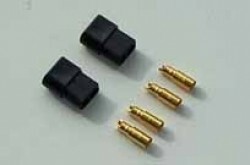 Two 4mm Male Bullet Connectors. Two Plastic Housings. REQUIRES: Soldering iron with at least 40W output. Replace damaged connectors or make your own custom BEC/JST wiring. Female Housing Shell only to build BEC/JST connectors. Sold per 1 each housing shell. Compatible with 8-13 gauge wiring. Handles up to 75A current. Male is battery side. INCLUDES: Three Male Connector assemblies. REQUIRES: Soldering iron with at least 40W output. Compatible with 8-13 gauge wiring. Handles up to 75A current. Female is the ESC side. INCLUDES: Three Female Connector assemblies. REQUIRES: Soldering iron with at least 40W output. Trick way to solder onto deans, one ends accepts youre wire, other end holds onto Deans Ultra solder point. Add solder. No more fumbling! 10 couplers per package. Deans Ultra Plugs are the worlds most popular for S-400 and up applications. Females are used on the battery pack. Plug is nicely marked in the rear showing positive pole so you can wire them to Deans Standard. 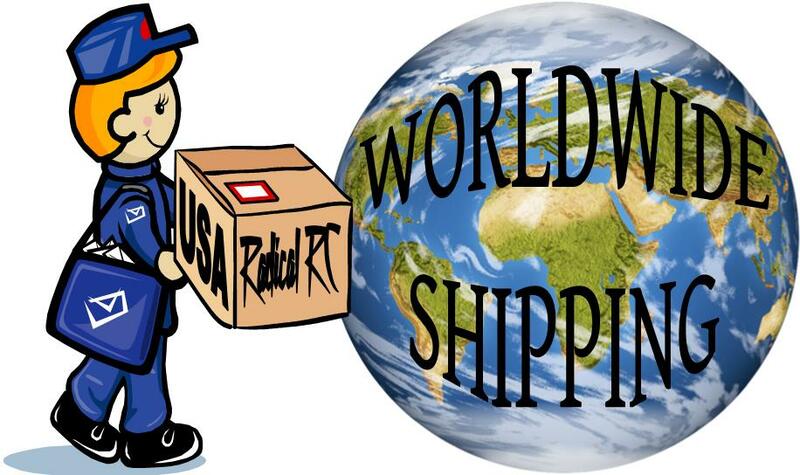 Package contains 1 each male and female genuine W.S. Deans plugs. We sell and use only Genuine W.S. Deans Plugs. Mounts one Deans Ultra female plug flush on the outside surface of your fuselage or power panel. Laser cut from quality materials. Includes all fasteners and doubler plate for your balsa fuse. Use as a charging or test port. Also very useful as a Key activated switch. Want a switch on your large electric model that can take the punishment? Use this mount and a shorting plug and you're there and without all the problems and resistance inherent in normal switches. Note, this mounting box is made to work with Genunie Deans Ultra plugs. There are a myriad of low quality "fall apart" copies of this plug. These copies can vary greatly in size and fit. Be certain to use a Genuine Deans Ultra plug in this box. If your not sure, the real plugs are red and come in a printed Deans package. If you're unsure select a genuine plug in the drop down box. Mounting box mounts from outside of fuse or panel only. 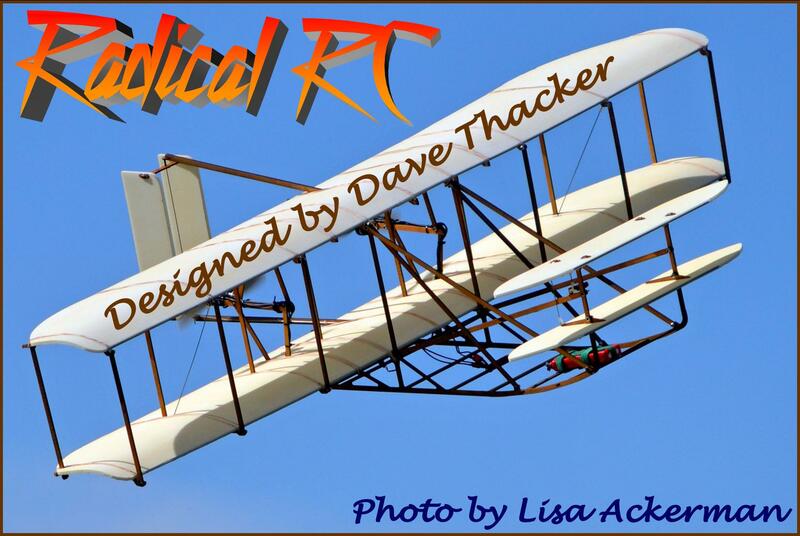 Use included doubler as an easy template to cut your mounting hole. Mounts one Deans Ultra female plug Inset or flush on the outside surface of your fuselage or power panel. Laser cut from quality materials. Includes all fasteners and doubler plate for your balsa fuse. Use as a charging or test port. Also very useful as a Key activated switch. Want a switch on your large electric model that can take the punishment? Use this mount and a shorting plug and your there and without all the problems and resistance inherent in normal switches. Note, this mounting box is made to work with Genunie Deans Ultra plugs. There are a myriad of low quality "fall appart" copies of this plug. These copies can vary greatly in size and fit. Be certain to use a Genuine Deans Ultra plug in this box. If your not sure, the real plugs are red and come in a printed Deans package. If your unsure select a genuine plug in the drop down box. Mounting box mounts from inside of fuse or panel only. Use included doubler as an easy template to cut your mounting hole. Deans Ultra Plugs are the worlds most popular for S-400 and up applications. Females are used on the battery pack. Plug is nicely marked in the rear showing positive pole so you can wire them to Deans Standard. Package contains 2 plugs. Two each, Quality, Genuine Deans Male Ultra Plugs. These are used on speed controls and charge cords. Polarity marked on solder side of plugs. Deans Ultra Plugs are the worlds most popular for S-400 and up applications. Females are used on the battery pack. Plug is nicely marked in the rear showing positive pole so you can wire them to Deans Standard. Package contains 4 plugs. Use as a plug marker and grip. Fit nicely over Deans Ultra, EC3, XT60 and other similar sized plugs. Provides a surface you can really get hold of. Each package is a set of 8 grips. Random color (green and/or white). *This is an aftermarket product not manufactured by the W.S. Deans Company. Deans 2 Pin Micro male/female set. The polarized set is the most popular, one pin is male, one female in each plug. So, they are unisex. Highest quality plug available for park flier (S-300 and below) applications. We like it up to 10 amps. Some will use these on S-400 but be feel you should use something a bit larger for S-400. Handy for connectons that need polarity reversal potential as this is a non-polarized Deans connector. Handy for many other purposes as well. HINT! On the battery, wire the red (+) wire to the male pin. This way your packs are all standardized and correct. Deans 2 pin male/female set. Great Plug, we like them up to around 10 amps. This is a non-polarized plug! Handy for many other purposes as well. Deans 2 pin male/female set. Use for battery or charger connection and popular E-flight connection. Comes with mounting plate & screws. 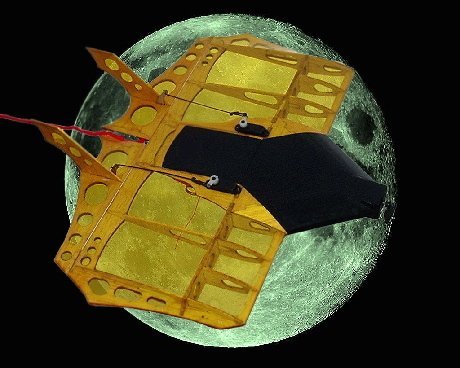 Mounts to fuselage panel or bulkhead for charging your onboard batteries, connecting onboard electronics. Handy for many other purposes as well. Deans 3 pin male/female, one set. Use for Servo, battery or charger connection. All Deans connectors come bare with heat shrink. Deans 4 pin male/female set. This is the 3rd most popular Speed 400 connector and the lightest of them all. Instructions on package, Use 2 pins for each pole, they are also polarized for error free use. 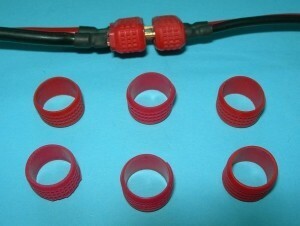 We suggest these plugs for applications from 8 to 20 amps. Can be used as battery plug: female-battery, male-speed control. Or, use as motor plug: male-motor, female-speed control. 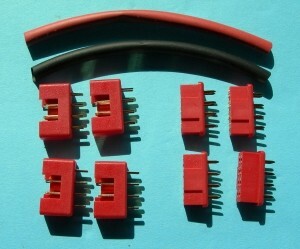 Deans 5 Pin Connector set. Polarized with pin spacing. Use as master connector to connect up to 3 servos in your wing with one plug! (one common +, one common -, 3 signal pins) Other uses as well. Deans 6 pin male/female set. Use for Servo, battery or charger connection. Other possible uses. Deans connectors are bulletproof. Great for single plug hookup of complex wings, use this plug up to 4 servos. Deans 8 pin male/female set. Use for Servo, battery or charger connection. Other possible uses. Deans connectors are bulletproof. Great for single plug hookup of complex wings, use this plug up to 4 servos. Useful for complex servo hook up, up to 6 servos connected with one plug. MFG claims up to 15 amps per pin in this plug so also useful for higher current applications with ganged pins on each pole. Polarized housing prevent improper insertion. Easily soldered. 6 Pin plug popular for single connector hook up of multi servo wings and electric motor connections. You get one pair here. Make up your own extensions, harnesses or other on board uses. Two each, battery side connectors. Designed for 13 and 14 gauge wire. Zero Loss, same resistance as 13 gauge wire. Total reverse polarity protection. Note: This connector assembly uses female pins, the shell is male, therefore gendered as "male assembly". Great plug, wire tube sized to accept our S-480 and under wire (17 gauge and smaller). This package includes 4 each 15 amp pins, 2 red shells and 2 black shells. This is one complete interconnect set. (connects one battery to one ESC for example). Anderson Powerpole housings may be assembled in several different configurations to achieve polarizing or proofing against connecting to wrong chargers/ESC's/harnesses etc.. The adjustable configuration of multiple plug housings is this connector systems finest feature. No exposed metal when assembled. Initial contact area (subject to arcing in many applications) is not the final contact area preserving this surface in best condition. Wiping action in plugging or unplugging self cleans the contact surfaces each time it is used. This is a package of 12 pairs with 15 amp pins. Contents: 12 black housings 12 red housings and 24 pins. This is a package of 24 pairs with 15 amp pins. Contents: 24 black housings 24 red housings and 48 pins. Great plug, wire tube sized to accept our Sub-C and under wire (12 gauge and smaller). This package includes 4 each 30 amp pins, 2 red shells and 2 black shells. This is one complete interconnect set. (connects one battery to one ESC for example). This is a package of 12 pairs with 30 amp pins. Contents: 12 black housings 12 red housings and 24 pins. Great plug, has open wire valley sized to accept even our largest wire (11 gauge and smaller). This package includes 4 each 45 amp pins, 2 red shells and 2 black shells. This is one complete interconnect set. (connects one battery to one ESC for example). This is a package of 12 pairs with 45 amp pins. Contents: 12 black housings 12 red housings and 24 pins. This is a package of 24 pairs with 45 amp pins. Contents: 24 black housings 24 red housings and 48 pins. This is a RAD new item! Radical RC Laser Cut Switch or connector mounting Box Kit to make your own custom mounting box for Anderson Power Pole Connectors. Anderson Power Pole connectors will slide connect to each other in a gang type set up. This box allows you to mount a 2 pole gang into a sturdy box so that you can easily plug your mating plugs into it. This version is for 2 Connector set up. The box will mount two different ways. Firewall mount or through a fuselage bulkhead. Also will "Flush or Cheek Mount onto side of any flat surface. Instructions include wiring diagram for such uses as: A switch or Load Check Port, Arming Key, Charge port, Glow driver or Voltage check port. 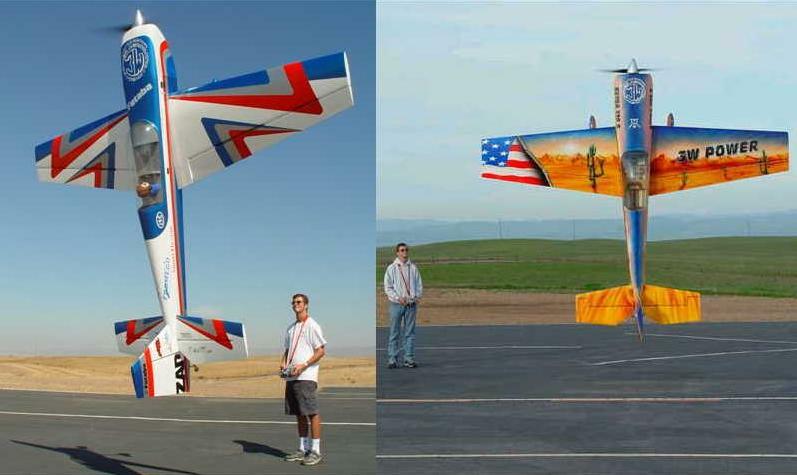 Note: When Arming Key is installed, it is flush to fuselage sides to reduce aero drag. Photo shows a display of the assembled box along side the kit laser cut parts sheet. This is a kit that must be assembled. This is a RAD new item! Radical RC Laser Cut Switch Box Kit to make your own custom mounting box for Anderson Power Pole Connectors. Anderson Power Pole connectors will slide connect to each other in a gang type set up. This box allows you to mount the 3 pole gang into a sturdy box so that you can easily plug your mating plugs into it. This version is for 3 Connector set up. Can mount in two different ways. Firewall mount or through a fuselage bulkhead. Also will "Flush or Cheek Mount onto side of any flat surface. Instructions include wiring diagram for combo Switch and Charging Port Wiring Harness. Excellent set up for larger power systems. 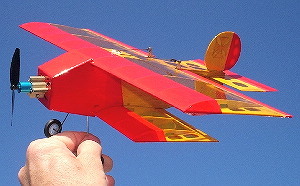 A simple plug in key made with Anderson Connectors arms the model for flight. Photo shows a display of the assembled box along side the kit with laser cut parts sheet. Anderson Power Pole Locking Pins, 20 each. Anderson Power Pole plastic connector housings are designed to interlock together. These pins will lock the connectors/housings together and keep them from sliding apart. When the connectors are mated together, there is a channel or hole into which these locking pins can be pushed into place. Easily inserted and removed with needle nose pliers. This is a pack of 20 each, 1/4" long roll pins. One Pair EC3 High Performance Connectors. Up to 60 continuous amps. Blue hard plastic, ribbed grip, polarity marked housings. Protected from shorting and polarity reversal. 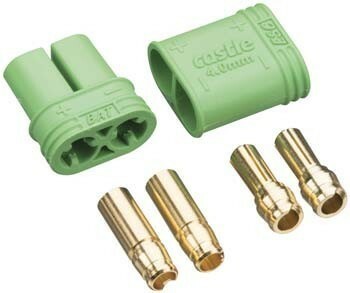 Heavy duty, high performance power connector. Use anywhere in your power system. Replace damaged connectors or make your own custom BEC/JST wiring. Enough parts to build ten BEC/JST Female connectors. Available in multiples of 10 below. Replace damaged connectors or make your own custom BEC/JST wiring. 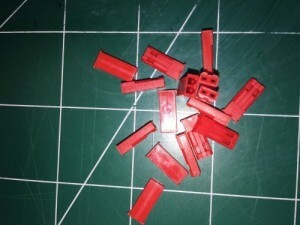 Enough parts to build ten BEC/JST Male connectors. 20 Gold Plated pins & 10 Male housings. Available in multiples of 10 below. This polarized connector set from Germany compares with Deans Ultra Plugs. For S-400 and up applications. Females are used on the battery pack. A female port protector plug is included, protecting the battery from shorting while unpluged. Package contains 1 each male and female and protector. Quality German product. Tired of paying $9.50 for the Kavan brand? 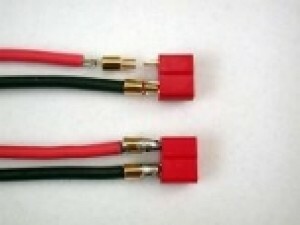 One pair of gold plated connectors 2mm pin diameter in a firm red plastic housing providing reverse polarity protection. Outstanding for higher quality projects. 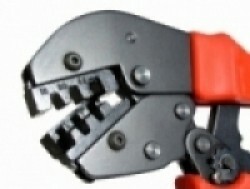 Two complete connectors included just as in picture. Connectors shown protruding from housings for purpose of showing all parts included. Totally compatible with Kavan product. Tired of paying $9.50 for the Kavan brand? 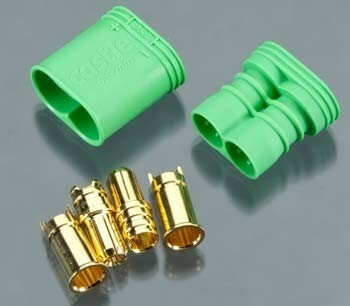 One pair of gold plated connectors 4mm pin diameter in a firm red plastic housing providing reverse polarity protection. Outstanding for higher quality projects up to 100 amps. 12 gauge wire. Two complete connectors included just as in picture. Connectors shown protruding from housings for purpose of showing all parts included. Totally compatible with Kavan product. Tired of paying $9.50 for the Kavan brand? 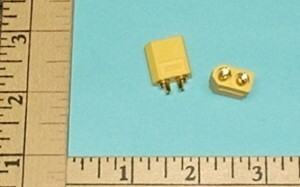 Two pair of gold plated connectors 3.5mm pin diameter in a firm red plastic housing providing reverse polarity protection. Outstanding for higher quality projects. 4 housings, 4 male pins, 4 female pins. 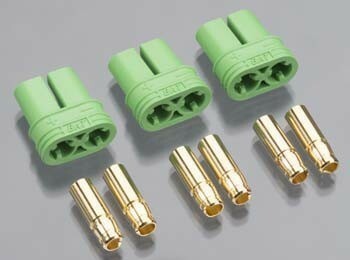 One pair of gold plated connectors 3.5mm pin diameter in a firm plastic housing providing reverse polarity protection. Outstanding for higher quality projects. Two complete connectors included just as in picture. Totally compatible with Kavan product. One pair, 2 housings, 2 male pins, 2 female pins. Battery to ESC plug set. Male Female kit to make High Current Connector compatible to Traxxas plugs.